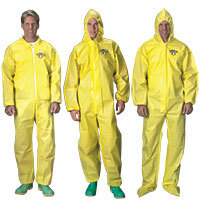 Level D Chemical Protective Clothing: You've come to expect quality products from Andax Industries. ChemMax® is constructed with a unique polyethylene barrier film and a continuous filament polypropylene nonwoven substrate. ChemMax® 1 garments bar many harmful contaminants from penetrating to inner clothing. A serged seam joins two pieces of material with a thread that interlocks. This is an economical stitching method for general applications. It is more commonly found on limited use clothing where dry particles are of a concern. 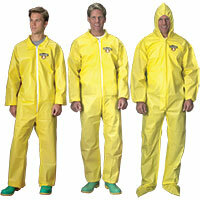 Level D Chemical Protective Clothing: You've come to expect quality products from Andax Industries. ChemMax® is constructed with a unique polyethylene barrier film and a continuous filament polypropylene nonwoven substrate. ChemMax® 1 garments bar many harmful contaminants from penetrating to inner clothing. A bound seam joins two pieces of serged material with extra material that covers the seam and is sewn in place. This provides an added layer of seam protection. 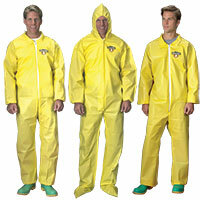 Level D Chemical Protective Clothing: You've come to expect quality products from Andax Industries. ChemMax® is constructed with a unique polyethylene barrier film and a continuous filament polypropylene nonwoven substrate. ChemMax® 1 garments bar many harmful contaminants from penetrating to inner clothing. A heat sealed seam is sewn and then sealed with a heat activated tape. This method provides liquid proof seams, and is especially useful for Level A and B chemical protective clothing.